Supplied: In three litre containers of peat free compost, healthy and well established, approximately 120cm (4 feet) high, with full planting and aftercare instructions. 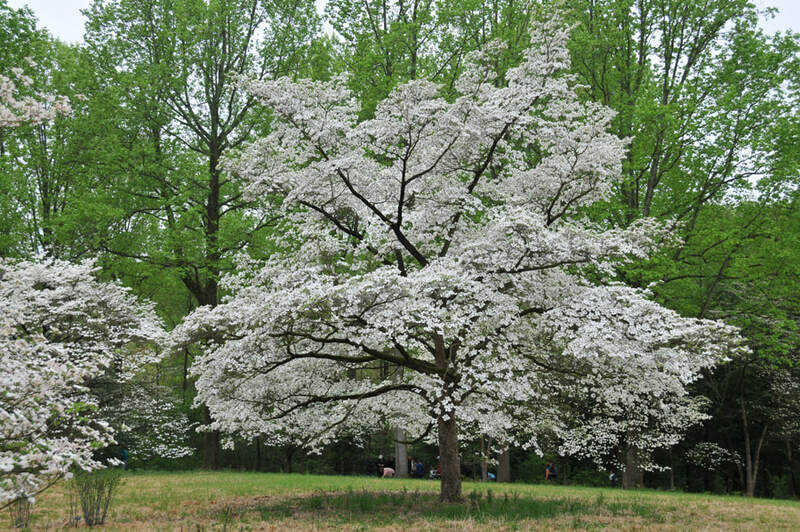 Flowering dogwood, or Cornus florida, is a beautiful small to medium sized tree that has a flat to rounded crown with layered tiers of gracefully bobbing branches. Dogwood blooms in the spring for 2 to 3 weeks. The “flowers” are actually bracts, four of them and they are the most dazzling white. Once the petals, or bracts have dropped, C.florida is surprisingly inconspicuous through summer until the weather begin to cool once more. Then its simple but curiously curled leaves put on a glorious display of rich autumn colours, followed in winter by clusters of pretty red fruit. Dogwood occurs naturally across the eastern seaboard of the United States and Canada, reaching down to Florida They do well in the UK too, but not on chalky soil. This is a woodland tree that prefers humusy rich, acidic soil and cool damp roots. Broken shade is preferred in hotter areas and more direct sun in cooler so yo can plant accordingly. This is possibly North America’s most elegant native tree and its fine proportions make it adaptable to any garden. It has three long seasons of spectacular interest and gives so much to the garden when often there is little else to admire.